We returned safe and (mostly) sound from our 5 month trek around Northern and Western Australia. (Click on photos for a larger view, or go to http://picasaweb.google.com/dandjribbans to see all our photos). We had a great trip, although it was exhausting and not without incident. 20,000 kms mostly on outback gravel and sandy tracks. No punctures but a broken rear spring bolt on the Mitchell Falls road, followed 3 months later by the same spring itself snapping like a biscuit (both main leaves). 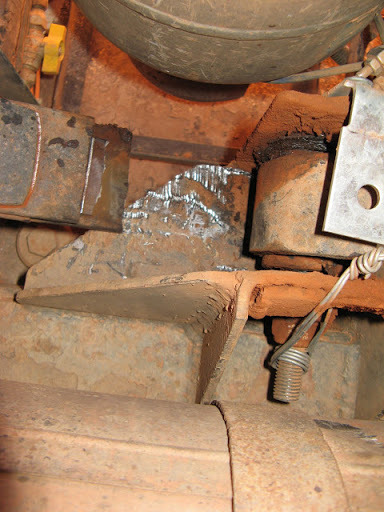 Different faults but the same end result, the rear axle slamming backwards on one side into the chassis and sending us crabwise. No dramas on lonely outback tracks though, but they did leave us on the side of the road for a day while we fixed them. We also had some very scary moments when we realised we were all alone in the universe for days at a time, with only our HF radio for company. We have been to some of the remotest places and tracks in the country from which there is no hope of recovery in case of terminal breakdown, and even the Flying Doctor might be many hours or days away. But overall the Oka performed remarkably well, it was economical, reliable (except for the few problems recorded herein, some of which were not entirely unexpected), fairly comfortable considering the track conditions, and none of the motorhome domestic systems that I had built seriously failed. There are always improvements that one can make of course based on experience, and many of these will be implemented over the summer, between treks. This is our GPS track loaded into Google Earth. 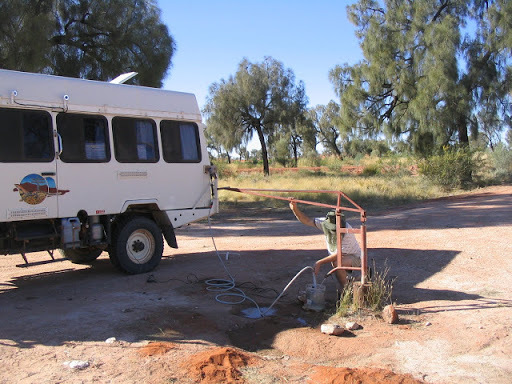 We started gently enough with a leisurely drive up the Oodnadata track to Alice Springs where I had to fix a slow leak on one of our reserve fuel tanks. 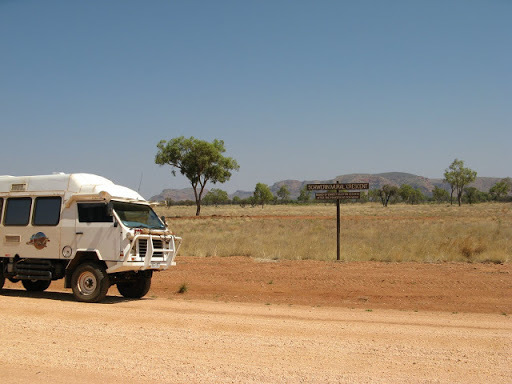 From Alice we headed 1200 kms west across the Gary Junction Road (one of Len Beadell's outback tracks ) between the Great Sandy and Gibson deserts and through Aboriginal lands to intersect the Canning Stock Route (CSR) at Well 33 (the Kunawarritji Community, diesel at $2.80/l). Highlights of this section were the very pretty desert scenery and the stands of Desert Oak trees around Jupiter Well. Me pumping water at Jupiter Well. We then had a fabulous 300 kms trip down the centre section of the CSR crossing 200 sanddunes to Georgia Bore (near Well 22) and then headed 200 kms west again into the Rudall River National Park, the 2nd largest and remotest NP in the country (and the loneliest, we were the only people there). From there we headed a further 300 kms to Newman for much needed supplies and retail therapy, and a taste of bitumen for a while. An easy but long drive then took us west to Exmouth and Ningaloo Reef where we had a Whale Shark Tour and I swam with 3 huge (6 m) whale sharks. I thought I would be scared ****less but I found they were so gentle and placid that it was not scary at all. I have photos I took underwater and a DVD taken by one of the crew to prove it. Even saw 2 humpback whales pass in front of me while snorkelling. Janet stayed on the boat and took photos. 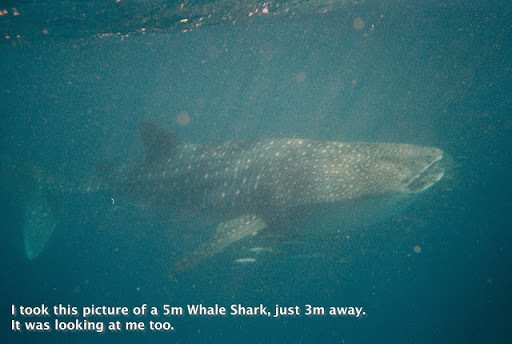 I actually took this picture, a 6 m whale shark only 3 m away from me, and looking at me! We spent nearly 2 weeks around Ningaloo Reef. It's so scenic it's difficult to leave but eventually we dragged ourselves through Marble Bar where we visited a WW11 secret airbase (never found by the Japanese, but we found it), which still has a fascinating array of runways and wartime supply dumps to fossick through. 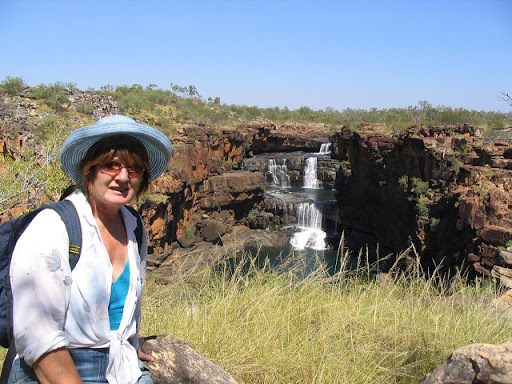 We did Broome again, mostly for supplies, then up to Cape Leveque, Derby and on to the Gibb River Road. We've done this track twice before but it still has plenty of superb gorges to walk and swim in. Half way along the track we turned north to the Mitchell Plateau where we hadn't been before, and this is where the real fun started. 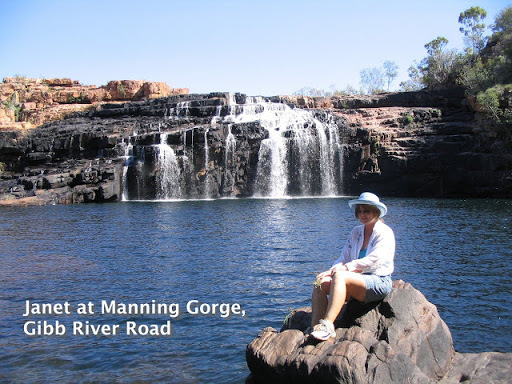 Janet at the Manning George Falls. Janet at the Mitchell Falls. The track to Drysdale River Station is good and they have a really good camping area. 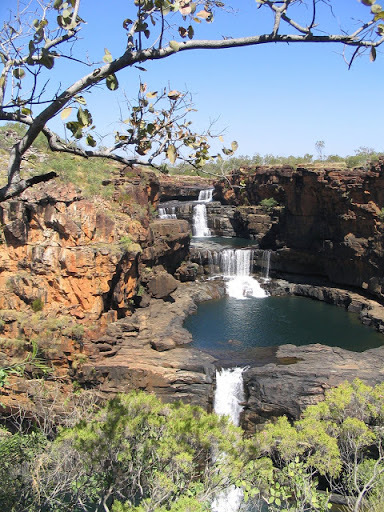 From Drysdale it's a 400 kms round trip to the Mitchell Falls which are truly magnificent. Along the way there is an excellent camp on the rocky banks of the King Edward River with plenty of Aboriginal art including Bradshaw paintings. Getting there however is another story. The Mitchell Falls road is wide but horribly corrugated and immediately leapt to No. 1 position on our "Worst Roads In The Country" list. 10-15 km/h is the best you can achieve without breaking something vital over the shattering corrugations, even with almost flat tyres. In fact we broke several things, including the rear wheel carrier mounting bracket which was fixed by (and still is held on with) rope. About 20kms out from Drysdale on the return leg, nearly out of gas, water, fuel and food (wouldn't you know it? 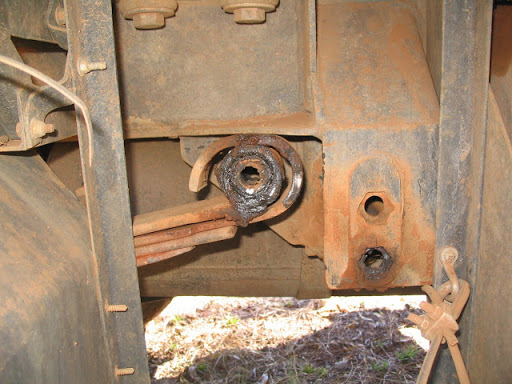 ), the main shackle bolt on the rear spring broke, leaving us stranded on the side of the road for 25 hours (Janet timed us) while we fixed it. It was hot and very heavy work jacking up the Oka and levering the axle back into position so we could replace the bolt. But we did it! It's not supposed to be like this! This is also the spring which broke 3 months later. While we were doing that, I noticed that the brake caliper had lost it's retaining spring and was imminently about to fall off. Being fully self sufficient and resourceful, I selected the correct size of tent peg (10mm) and tapped it into the caliper in place of the spring and bent the end over where it worked fine and is still there 5,000 kms later. (Or it would be if I hadn't had to remove it to replace a leaking oil seal in Katherine. Luckily I had 2 tent pegs). Anyway nothing could dull our sense of achievement at having done a major repair on the side of the one of the remotest tracks in the country. As luck would have it, this experience was to come in handy 3 months later when the spring itself broke on the Mereenie Loop Road north of Kings Canyon. 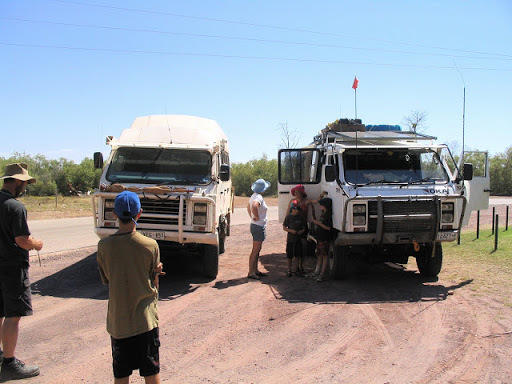 However to regress, we completed the Gibb River Road to Wyndham, then to Kununnurra and back to the bitumen for the drive across the Victoria Highway through Katherine, Litchfield NP to Darwin. We spent a couple of weeks in and around Darwin which is a delightful place but ultimately it got too hot and humid for us and we retreated south supposedly to escape from it all. We were wrong, we escaped the humidity but not the heat. Returning south we had the choice of 3000 kms of easy but boring bitumen to Adelaide or do some more outback travelling. So naturally we chose the latter. We returned to Katherine the back way via Litchfield NP again and spent a few days there doing a full maintenance job on the Oka. Where we were going we would certainly need it. From Katherine we headed down the Buntine Highway to Halls Creek where it was 38º, but they had a swimming pool. 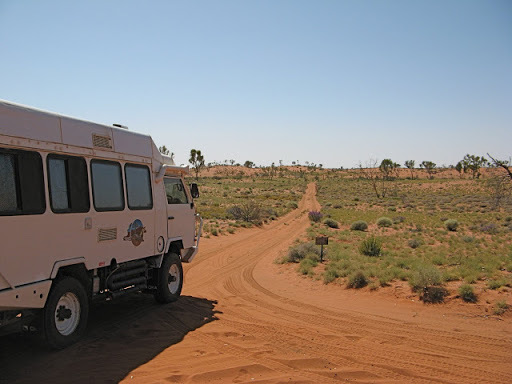 We had to stay for the weekend, waiting for the Telecentre to open to pay some bills, then headed down the Tanami Track to Wolfe Creek meteorite crater. This was our 3rd visit but it's always interesting. Just south of there we turned down the northern end of the Canning Stock Route at Billiluna and started a 700 km trek across the Great Sandy Desert back to where we first met the CSR at Well 33. The 700 kms took 7 days and we crossed 620 big sand dunes averaging 15km/h and getting stuck on several (we have the videos). We met only 5 other vehicles in 7 days but it was the most exhilarating drive imaginable, if (and it's a big IF) you are fully prepared and totally self-sufficient. It was also very hot every day (38-40º) and we drank 5-6 litres of water a day each, even with the A/C on full. There are 51 wells on the CSR but only a handful have useable water in them (which you have to winch out manually, 19th century style). Most of the others are in ruins since they haven't been used for their original purpose for 50 years. We came across a burnt out a modern Ford Explorer 4WD (which is marked on the maps near Well 49), a poignant reminder of the risks associated with being in this area. 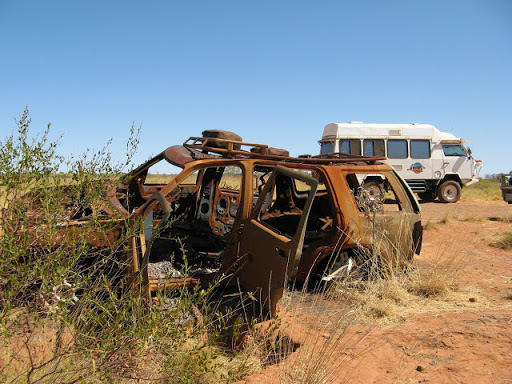 Apparently they pulled over onto some spinifex with a hot engine which ignited the spinifex and that was that. Their fridge and jerry cans are still there, all exploded in the heat. It was at that point that we realised that there was only one way our Oka was going to get off this track and that was under its own steam. No vehicle recovery is possible from here. (Note: always take tent pegs and fencing wire, they are very useful). In a mess of sand dunes and tracks a moving map is essential. The blue range rings around our position are 1 km apart, and so are the sand dunes. Our other vital piece of equipment is a GPS and moving map computer display. Without these we would have been seriously worried many times about our exact location and direction. 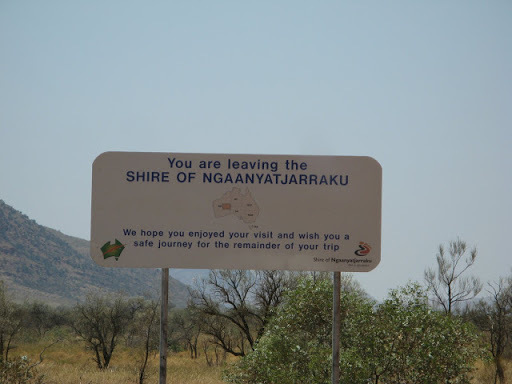 Signs in the outback are either non-existent or very basic and tracks can be very confusing. We relied on it many times when tracks disappeared or more often there were multiple options. Typical outback sign, if you can spot it. At Well 41 we had a lay-day because it was Grand Final Day. There are no radio stations in the Great Sandy Desert so I rigged up a long wire aerial over a tree (first I had to find a tree, not common in deserts) and just managed to drag in a faint ABC signal through the noise. So we sat in the shade and listened in. Technologically successful but unfortunately not the right outcome. By half time I had lost heart and spent the rest of the match fixing the fridge door which couldn't stand the vibration and had fallen off with a broken hinge. Superglue to the rescue, braced by an aluminium bracket. Well we made it back to Well 33 OK and refilled with 160 L of fuel (at $2.80/L for diesel, unleaded petrol was $3.20/L). The sanddunes had nearly doubled our fuel consumption (down from 7 to 4 km/l), one of the other significant risks of being out there. We've never spent over $400 on fuel in one go before, but luckily they have Eftpos facilities at the Kunawarritji store. We were delighted to pay $2.80 a litre for diesel since fuel is rare out here and more important than water. With fuel you can go and find water. The opposite isn't true. For the record, we carried 280 L of fuel, enough for 1200-1800 kms range depending on terrain, although we never got below 80 L in hand, enough for at least 400 kms in an emergency, 200 L of water (about 5-6 days worth with a daily frugal shower) and gas and food for at least 2 weeks. We crossed our previous track from Alice Springs at Well 33 (good water from the tank and windmill there) and headed down the Gary Highway (another one of Len Beadell's outback tracks). 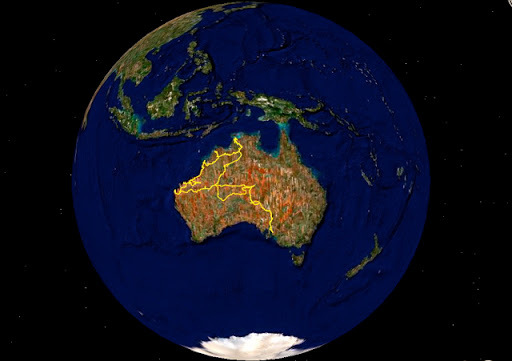 This is a dead straight but very corrugated 400 km track across the Gibson Desert. It ends at Everard Junction on the Gunbarrel Highway where we turned east and headed another 400 km to Warburton Community. Just 16 km off the top end of the Gary Highway is Veevers Meteorite Crater. It's 80 m across and 15 m deep but we'd never heard of it until I researched our proposed route. The visitors book there still contains the original hand written notes by the fellow who identified it in 1975. Only a handful of people have ever been there. At McPhersons Pillar, along a 30 km track east from the Gary Highway, we were at our remotest and loneliest point ever. The nearest help would have been at Warburton, 300 kms to the SE as the emu flies. In the 5 days and nearly 800 kms between Kunawarritji and the Grand Central Road junction we had seen not one single vehicle or person. Not a good place for an emergency. There were plenty of camels, dingoes and spinifex hopping mice though. The Gunbarrel Highway is badly washed away and quite dangerous in places. In fact the eastern section has been closed totally. The route now takes you down the Heather Highway (known as the Horrible Highway for corrugated reasons) to the Great Central Road (sounds grand but is just a wide corrugated gravel track). The Gunbarrel passes a pleasant range of hills called the "Schwerin Mural Crescent", named by Ernest Giles after the Princess of Schwerin. No, we had never heard of it either, or the Princess of Schwerin. (Wikipedia says: Schwerin is a city in northern Germany and the capital of the state Mecklenburg-Vorpommern). So now we all know. From Warburton we headed along the Great Central Road to Giles Met Station, established by Len Beadell in 1955 to provide meteorology info for weapons testing at Woomera. We wanted to do a tour of the station but they had "computer problems" so it was cancelled. We did see the launching of the daily weather balloon though, which they still use for acquiring upper atmosphere data used by commercial aircraft. We thought we were nearly home but no. From Giles it's a further 300 kms via Docker River to Uluru and civilisation at Yulara, and our first bitumen since Halls Creek 2000 kms to the north.The last part of the track to Yulara was very unpleasant, 40º and blowing a hot gale from the west. Our own dust was overtaking us and the engine was overheating since there was no air blowing though the radiator. At Yulara there was a sand storm and even worse, the swimming pool was closed for maintenance. Luckily they had made arrangements for campers to use the pool at one of the resort hotels for free. So with renewed enthusiasm we left Yulara (still 450 kms from Alice Springs mind you) and headed to Kings Canyon. It was stinking hot again so we only did the short canyon walk since we had done the superb rim walk twice before anyway. From there we headed around the gravel Mereenie Loop Road to Alice Springs. This road had worsened considerably since our previous trip and within 30 kms the rear spring broke both its main leaves. Snapped just like a biscuit. 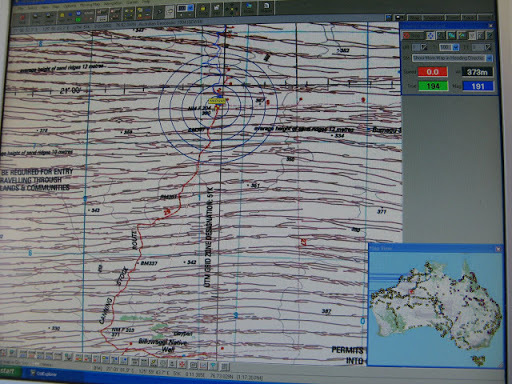 Presumably the previous 2000 kms of corrugations had weakened it and a few kms of smooth bitumen had finished it off. Now I knew where the creaking noises had come from. Not much holding up the Oka, just the edge of the broken spring. Anyway by now we were fully experienced in fixing such things and we had the axle strapped to the chassis in a couple of hours and were on our way again, but ever so slowly, as we crawled 260 kms into Alice Springs (fortunate name). It took us 3 days and we used our HF radio to call for some assistance. The radio base operator made some phone calls for us and by the time we arrived in Alice, a spring repair company was expecting us and fortuitously had managed to find a second hand spring for an Oka. They fitted it on a Saturday morning and we were on our way within 24 hours. The value of our HF radio has proved itself. We have heard dozens of other emergency calls before but this was the first time we had made one ourselves, although we were never in any real risk of getting stranded. If it had happened a few weeks earlier the outcome would have been different but we would still have fixed it and got mobile again. The journey back to Adelaide was uneventful but just to push our luck a bit further, we diverted across the Painted Desert to Oodnadatta and then down the Oodnadatta Track to the Flinders Ranges and back home. We arrived 15 minutes late, but after 5 months way we didn't think that was too bad? This is just a snapshot of our adventures, plenty more things happened that we still have to tell. We had a GREAT trip and after a rest we'd love to do it all again. 20,000 kms, 5000 photos, 3000 L of fuel, 120 different campsites, 8 major outback tracks, 4 other Oka's seen, 3 deserts crossed, 2 birthdays, one spring broken, no punctures, cheaper than living at home. Not a bad equation.